Today is International Religious Freedom Day — and the reason it’s today is because on this date in 1659, three Quakers were scheduled to hang. Their crime? Being a Quaker in Boston. That was it. The two men — William Robinson and Marmaduke Stephenson were hanged. Mary Dyer was dramatically pardoned at the last second with the rope around her neck. 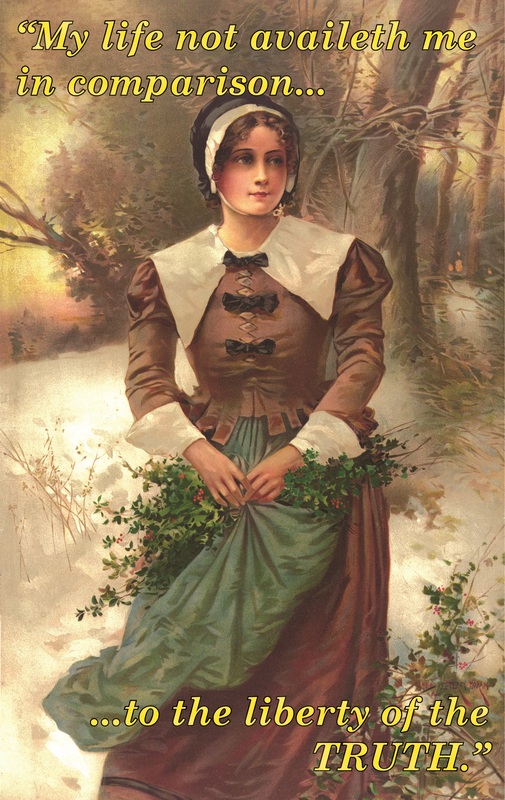 It was also Mary Dyer’s 26th wedding anniversary, but rather than spend the day with her husband (the attorney general of Rhode Island), she chose to stand up for her right to believe as she wanted. Though Mary would be hanged seven months later, her battle — and that of her fellow Quakers — should give us pause today to remember those who sacrificed everything for our First Amendment rights: freedom of religion and the separation of church and state. October 27 has been celebrated as International Religious Freedom Day since 1998 to honor their sacrifice, so take a moment to remember that no matter what your beliefs are, three people more than 300 years ago were willing to die for your right to believe however you want without prosecution. To learn more about Mary Dyer’s heroic story, pick up a copy of Mary Dyer, Friend of Freedom here. This entry was posted on October 27, 2014 by johnbriggsbooks in History, Mary Dyer and tagged american history, children's books, First Amendment, Mary Dyer, non-fiction children's books. american history, Nonfiction, religious freedom.